Crosman Marines Challenge All-in-One Airsoft Kit - 2 Spring Powered Pistols, Glock Style, 325 fps, 12-Round Magazines; 1,000 6mm, .12g BBs; Target - USMC Licensed - Competition, Practice, Family Fun | BUDK.com - Knives & Swords At The Lowest Prices! 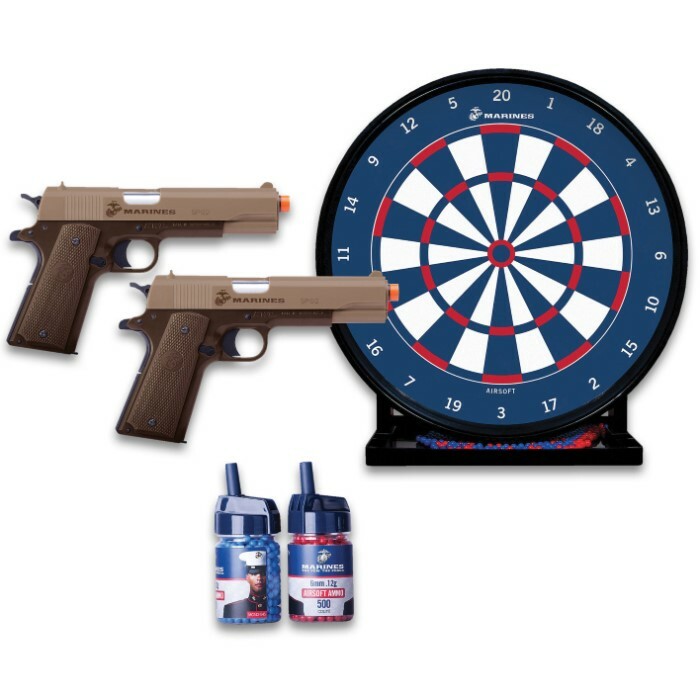 The "Marines Challenge" Airsoft Kit includes all the gear you need to hone your aim or challenge a friend to a good old fashioned Marine-style shooting contest; but it also comes loaded with a whole lot more: quality, value, and - perhaps most importantly - tons of good, clean fun! 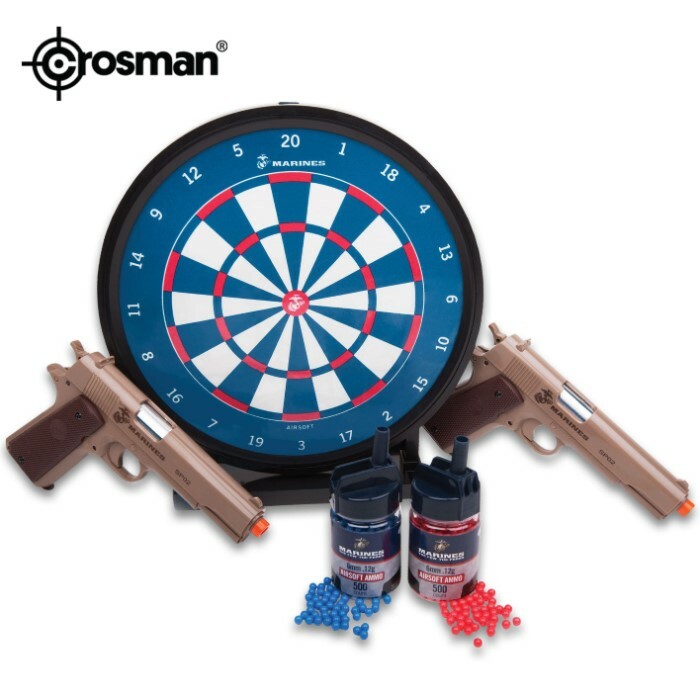 From the air gun experts at Crosman, this convenient, affordable, all-in-one airsoft solution features two spring-powered airsoft pistols, a regulation target, 1,000 rounds of ammo and instructions for six different target games. 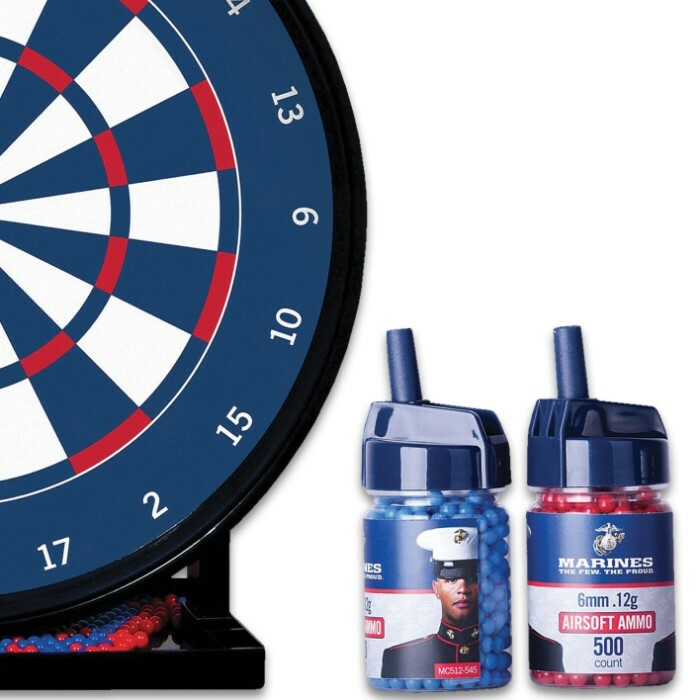 The kit is officially licensed by the United States Marine Corps, and every piece pays homage to this proud, storied branch with patriotic and/or military-themed accents like USMC insignia and red, white and blue color schemes. Each of the Glock-style airsoft pistols is premium quality, boasting a metal, smooth bore barrel, front and rear sights, a 12-round magazine and more. The powerful handguns shoot 6mm airsoft BBs and yield impressive muzzle velocities of up to 325 fps with .12g rounds! Even the kit’s target is top-notch, with a handy reservoir for catching BBs that reduces waste and saves you money. And that’s not the only way the Marines Challenge Kit saves you dough! This all-inclusive kit represents a far better value than buying the included items piece-by-piece, and since it’s from Crosman and bears the USMC’s seal of approval, you can rest assured that - despite its surprisingly affordable price - the Marines Challenge Airsoft Kit will bring you years of shooting fun. Add our unbeatable prices, and there’s no need to look further for an affordable activity the whole family can enjoy! 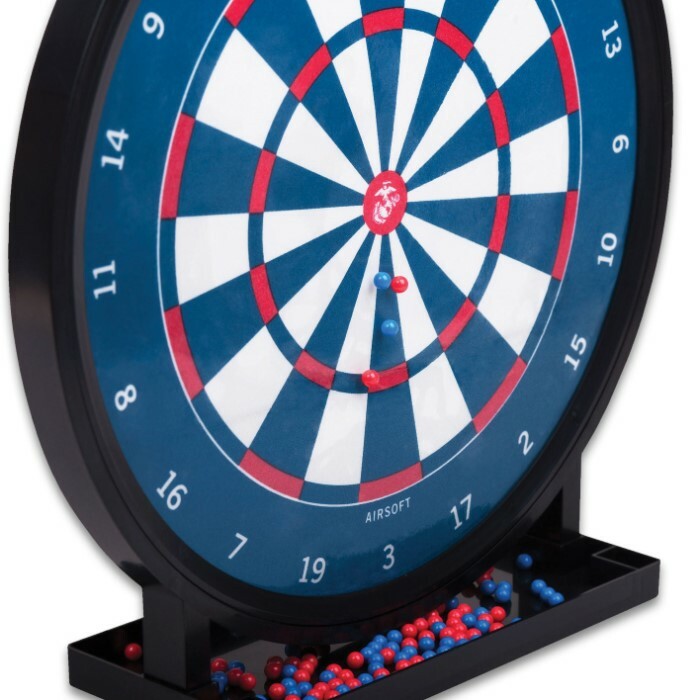 Also great for friends, social clubs, gun clubs or as a gift!